Amos 1:1 tells us that this sheep breeder and Arborist (7:14) turned prophet was from a place called Tekoa (תְּקוֹעַ, teqoa’, “the place for pitching tents”). 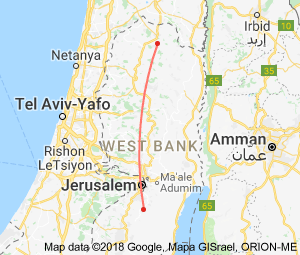 Tekoa is almost twelve miles south of Jerusalem. Although the book of Amos contains words of judgement to more than a single people group, the phrase “…which he saw concerning Israel…” tells us it was Israel to whom the prophetic message was delivered. The first verse clearly establishes the message on the biblical timeline by referencing other historical facts. It tells us who the king of Judah was and who the king of Israel was at the time that Amos declared God’s message. Additionally verse one anchors the time to “two years before the earthquake”. The region is no stranger to earthquakes so the quake reference was probably more meaningful to the original biblical audience than it is to the biblical student of today. Aside from establishing the date, there maybe another reason both the king of Israel and the king of Judah are mentioned. We know that Amos and Isaiah were contemporaries. Compare the first verse of Isaiah with the first verse of Amos. Like Amos 1:1, Isaiah 1:1 identifies the primary recipient (Judah and Jerusalem or Southern Kingdom) of the prophetic message. Unlike Amos 1:1, Isaiah 1:1 excludes a reference to the King of the Northern Kingdom. It is possible the message of Isaiah was intended solely for the Southern Kingdom, whereas the book of Amos primarily was for the Northern Kingdom, with a message for the Southern Kingdom as well. Regardless the difference between the two introductory verses are interesting. Amos recounts his divine call into the prophet office to Amaziah in Amos 7:14-15. The narrative does not include any reference to how Amos felt about being suddenly separated away from his home, his profession, friends and family. Did he wrestle over the call before he said yes? Was he fearful at the task before him, or was he honored and excited to be used by God? We aren’t told. When I read these two verses I don’t get the sense that God said, “Hey Amos, I have this job for you. All I want you to do is say some things, then write them down. It’s up in dangerous territory where they don’t fear or worship me. They won’t be too happy to hear what you have to say – it might even cost you your life. Are you interested or should I look for someone else? I understand if you don’t want to leave your successful business and your loving family to do this hard and thankless job for me. What do you say?” On the contrary Amos 3:15 says, “…The LORD took me…”! Read it for yourself. Sometimes I think we believe we are not qualified to be in service to Yahweh. We don’t have biblical training, don’t really know enough about the Bible, and aren’t skilled communicators. So and so would be a much better choice. God would be better off using someone else. Do we really know better than God who He should use and who He shouldn’t? I don’t know if you remember or not but God was angry when Moses tried that line. It didn’t get Moses excused from service, but rather his brother Aaron was conscripted into service alongside him. If you would say, “God has never asked me to do anything for Him”, I would ask you a few questions. How do you expect Him to call you? Are you expecting to hear an audible voice? Are you looking for a burning bush experience or the gentle promptings of the Holy Spirit? Have you positioned yourself to hear His call? Are you regularly in His word and prayer? Obey God. Do as He asks great or small. Worship Yahweh in service. You will be blessed. No Replies to "Amos - The Journey"